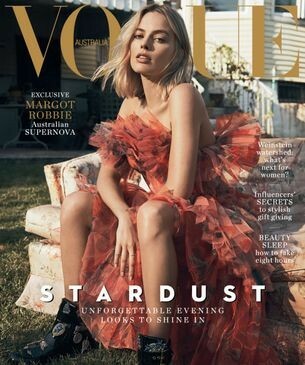 –Margot Robbie, who is getting serious Oscar talk for I Tonya, talks about sexual harassment and marriage in the new Vogue Australia. -Clear your calendar! Prince Harry and Meghan Markle will be married at St George’s Chapel in Windsor in May. -Meanwhile, the behind-the-scenes footage from Harry and Meghan’s interview is all kinds of adorable. -Also, I love how footage from Meghan’s time as a Deal or Not Deal suitcase girl is everywhere today. But remember when she was in Fringe? –Jennifer Lawrence says Darren Aronofsky wanted to talk about mother! all the time and she just…didn’t. -The first two hours of the CW crossover have been super fun so far — despite the Nazi-ness of it all (did we REALLY need to see Oliver as the fuhrer?!?) Ratings-wise they did well, but not as well as previous years. -I take back my (very weak) defense of Armie Hammer yesterday. He deleted his Twitter over that Buzzfeed article. Oh, muffin. -Yeah, Angela Lansbury made some BS comments about how women “must sometimes take blame” for sexual harassment but…she’s old. -I stopped watching Dynasty about 20 minutes into the first episode but man, casting Nicollette Sheridan as Alexis Carrington is a brilliant move. -It’s probably not a good sign that the new show from the creator of Gilmore Girls is being called her version of The Newsroom. -The Avengers: Infinity War trailer is coming tomorrow. Buckle in for bearded Captain! –Jennifer Garner and Josh Duhamel star in the coming out story Love, Simon Trailer.